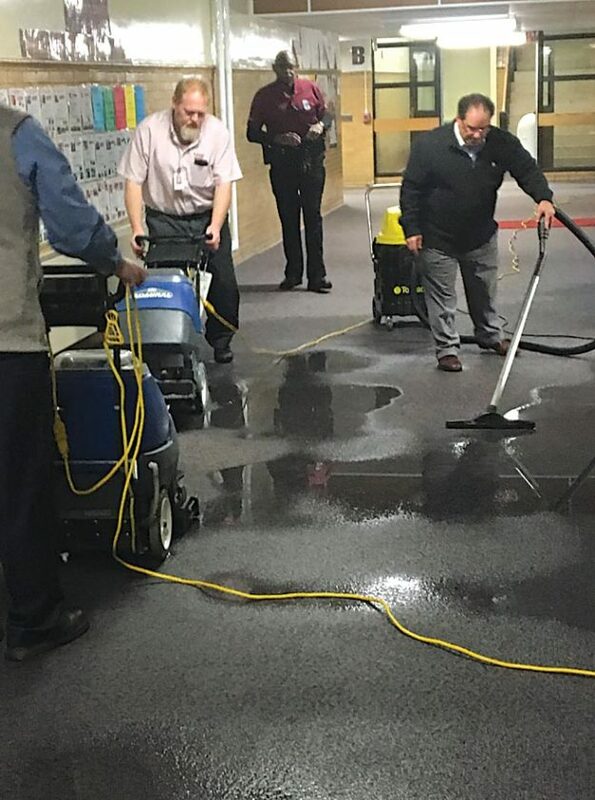 Mirror photo by Russ O’Reilly / Altoona Area School District employees clean up water from what was suspected to be a burst pipe in the 90-year-old B building during a meeting Monday night in which the board voted to delay its pursuit of a new high school project. The Altoona Area School Board voted 5-4 Monday night to put a two-month pause on the proposed $88 million high school project, even as a broken pipe flooded a nearby hallway with 2 to 3 inches of water. District administrators tried to get an emergency stop to the meeting when the pipe broke, but consideration of a motion to pause the project by board newcomer David Francis proceeded. “Electricity could be compromised at any moment,” an administrator interjected during the meeting. The controversial high school project would in part replace the 90-year-old B building where the pipe broke. Francis, Kelly Irwin Adams, Ed Kreuz, Vice President Sharon Bream and Ron Johnston pushed through the measure to pause the building project. President Dutch Brennan, Bill Ceglar, Wayne Hippo and Rick Hoover voted against it. “The purpose is to look at other options than an $88 million project,” Francis said. “We are new on the board. I want to look at more options,” she said. For a year prior to the November election of four new members, the board has been following the state Department of Education’s schedule for school construction. The measure pushes back the Feb. 12 vote scheduled to solicit bids for construction. The board had been scheduled to accept a bid on April 9. Superintendent Charles Prijatelj clarified that the two-month halt will neither stop the bills being paid pursuant to KCBA Architects’ contract nor the eventual vote on whether to put the currently proposed project out to bid. The plan entails building a new $47 million building on the current intramural field, renovating the A building and demolishing the existing B building. “The board has spent $5.5 million to this point. Yes, we can delay the process. If you delay the process, you throw the project out of the summer (construction) start window.” The new building was slated to open in fall 2021. The two-month delay may give the four new board members options to consider. Francis followed his motion to delay the $88 million project with a motion to welcome McKissick Associates Architects to present the board and public with alternatives. Francis said the firm would give the presentation at no cost to the district. Francis withdrew that motion after district solicitor Brennan Moran said he must check for any exclusivity clause in the board’s contract with KCBA Architects before other options are considered. Pending solicitor approval, the board could hold a special meeting later in the week to vote on welcoming other firms including McKissick to offer alternatives. Francis then asked the board to consider re-establishing Washington-Jefferson Elementary School. That school was one of two closed in 2013, exacerbating capacity issues at other schools. After the meeting, Bream and Johnston said they were pleased by the motions Francis made. “I am very happy with it. We have to look at alternatives,” she said. She also noted the timeliness of the leak. “The leak was definitely unique,” she said. Bream was on the board that closed Washington-Jefferson. “We were constantly belittled for years for closing W-J. Now we’re being belittled because we want to reopen it. Where’s the common sense in that?” Bream said. Brennan was dismayed by Monday’s actions. “They are wanting to do things the previous board already did. They could have asked us about the options we looked at. I would have sat down and talked with them,” Ceglar said.